I agree with the Cheshire Cat. If all you want to do is get “somewhere,” you will certainly get there if you walk long enough. The question is, is that what you want, “to get somewhere”? What if you could do more than “get somewhere”? What if you could achieve your hopes and dreams? What if you could create and achieve a vision of future you? In Richard Chang’s, The Passion Plan, he convincingly explains if you look to your heart and follow your passion, you are capable of achieving your hopes and dreams. 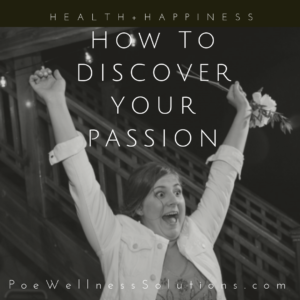 To achieve optimal Health + Happiness, to build the life you want, you must embrace your passion. You will create new opportunities and possibilities for change that others may view as lucky. For many of us, first we must (re)discover our passions. Throughout his book, Chang beautifully explains his seven step guide for discovering, developing and living your passion. He shares stories, provides worksheets and got me passionate about my passions. He describes passion as — personal intensity, the special part of our nature that fuels our strongest emotions. We are all born with passion but we do not all enjoy our lives exploring our passions — activities, ideas and topics that elicit these emotions. Passion is natural. You do not need to create or force it but you nurture it and find its best use in your life. It is dynamic. As you explore your passion it will evolve and find its way throughout your life. Passion is empowering. Exploring your passion fuels success and brings out your best. What could be viewed as a defeat is instead seen as an opportunity for growth; enhancing the quality of your day-to-day life. Lastly, it is unconditional. You may have unknowingly suppressed it or lost sight of it, but your passion is there. It is a given, a constant and will provide you the motivation to continue forward when you thought you had nothing left. When we act from passion, we flow. We loose track of time. We become active participants as opposed to passive observers. Chang separates passion into two categories: content-based and context-based. Content-based passion focuses on a highly-specialized topic. Athletes typically have a content-based passion. Someone that excels and is passionate about golf would most likely not be interested in playing basketball or tennis. Their passion is golf. Context-based passion centers around a theme and not a specific activity or topic. If that same golfer was passionate about competition and not golf then basketball and tennis may be equally compelling as it is another opportunity to compete. We do not have to limit ourselves to a single passion. Our lives can be filled with content- and context-based passions. Passions do not have to be central to our lives at all times. Threads of passion may run deep below the surface, only to emerge at a later date. My sister has been passionate about reading since we were kids. I thought she was passionate about books. She commented how she loved holding, reading and sharing them. A few years ago she acquired a Kindle. This lead me to conclude she was passionate about reading. Then she started a blog … Wild About Books. I wonder if in time she will write a book. Maybe her passion is sharing stories or the magic of mixing words and creating vivid imagery. She is the only one that truly understands her passion but there is a theme weaving through her life. I look forward to reading her first book and maybe attending Wild About Books Workshops as she shares her talents and teaches others. Are you wildly aware of your passions? Have you always known what fuels you? Do you see a theme running through your professional and personal life? Or are your passions so deeply hidden you question if they exist? No worries. We all have passions. Let’s get to work. The Past ~ Think back to your childhood. What did you love to do and how did you feel while doing it? Did you spend hours in your room constructing lego worlds or reading until you could stay awake no longer? Did you play in the woods or prefer to stay inside with video games? What subjects did you enjoy in school? Why? What did you dream of doing? Make a list of potential passions. How do you feel? Are these things still in your life? Why or why not? The Present ~ Wake up and give attention to your life. What do you love about your life, right now? What do you tolerate? Which activities are you simply enduring? What aspect of your day would you miss most if it were gone? Why? What do you look forward to from day-to-day? The Future ~ What do you hope for most? If a magic wand appeared and your future had no obstacles, what would you want to do, create, achieve, be? No worries of what is realistic. Our wildest ideas can provide insight into our passion. 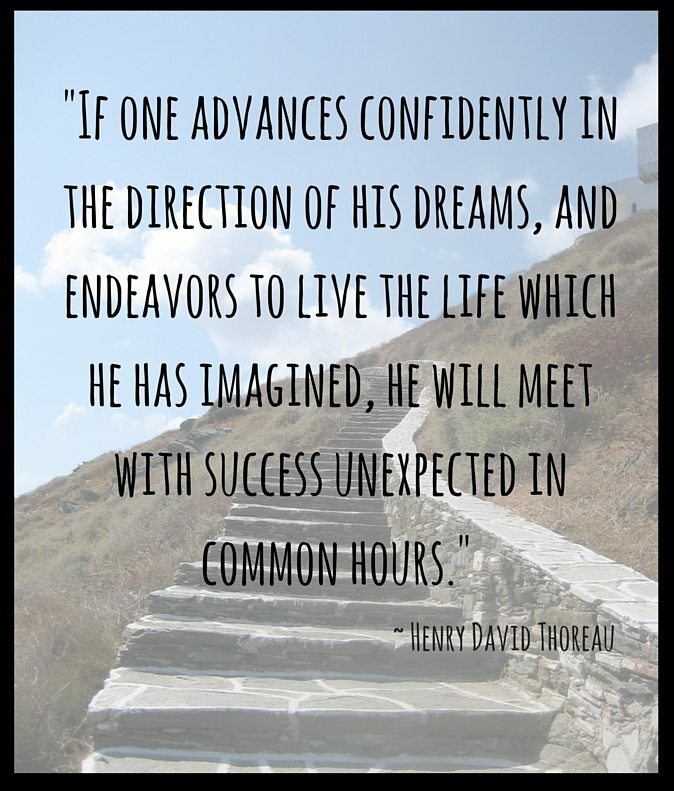 An immediate connection may not be obvious but take time to dream the impossible dream and then reflect on the relation to your potential passions. Your Peeps ~ Schedule time with a friend, family member or colleague. What do they see as your talents and abilities, your strengths and weaknesses? When do they see you “light-up”? We get so caught up in what we are doing that we don’t see how it inspires us. Let those closest to you be a window into your passions. Explore ~ If your potential passion list is a wee bit lackluster then it is time to explore. Discuss your passion pursuit with others. If you know someone attending a class that interests you (i.e. wood working, rock climbing, yoga, playing an instrument, cooking, etc. ), ask if you can tag along. Get involved. See how it feels. Find ways to test your potential passions. What activities do you enjoy but don’t feel passion? Explore what you like about the activity. Maybe you enjoy volunteering at your child’s school. What gets you excited about that? Is it working with the children? Is it interacting with the teachers? Do you find yourself regularly in a leadership or problem-solver role? Rediscovering your passions may be a slow process. As potential passions are identified, Chang recommends a Passion Litmus Test. A few of his test questions are below. The more yes responses, the more likely you are on your passion path. Do you lose track of time when engaged in this activity? Do you perform beyond your normal capabilities when engaged in it? Is your energy level higher when engaged in it? Do you get excited in anticipation of engaging in it? Do you feel more confident or empowered while engaged in it? Discovering and exploring your passions is a life long pursuit. Have fun! Learn as you experiment. The vision of future you creates a vivid and clear picture of what you want in your life, your purpose, the big picture for future you. To make change, to reach your hopes and dreams, to attain your optimal Health + Happiness, you have to define it. 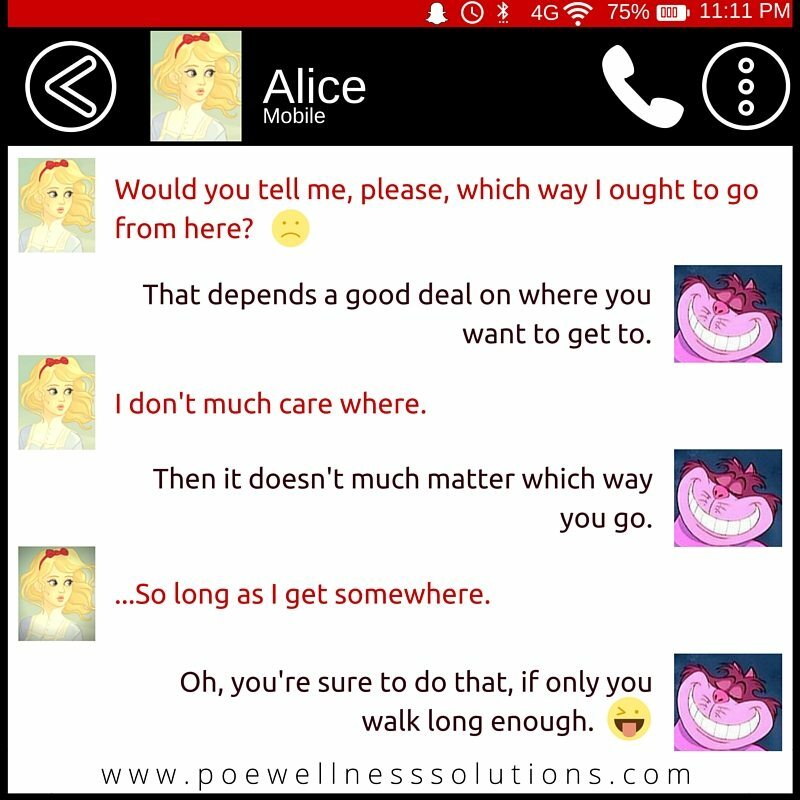 Had Alice’s vision been more clear, she and the Cheshire Cat may have had a very different conversation. When I was working with a Health Coach and establishing my business, we hit a big bump in the road because I struggled with a vision for my business. My limiting beliefs made it difficult to have a clear vision of me as a business owner. With hard work, soul searching and huge passion, my vision is clear (and always evolving). It worked for me. Here I am, Poe Wellness Solutions. Get out pen and paper, maybe even colored-pencils or crayons. Follow the instructions below and answer the questions that apply. If you feel inspired to create a picture or write a story, let it happen. The more vivid your vision, the stronger your chance for success. Instructions: Enjoy a few cleansing breathes. Maybe even allow your eyes to close for a moment and then continue reading. If you have been quickly skimming through the information, well, slow down for a few moments. Notice how it feels to simply focus on your breath. Imagine a giant white board in front of you. The board represents your future health and happiness. If something is on your whiteboard that you want to get rid of … erase it. What do you want to add? Pick up a marker and add it. Close your eyes a few moments and create a whiteboard vision of your ideal health and happiness. 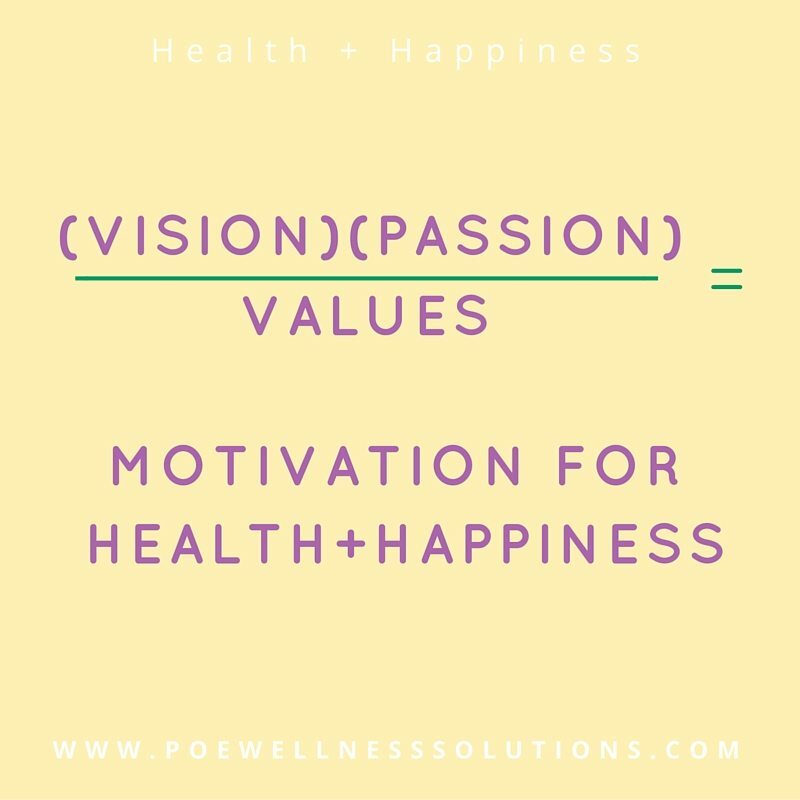 What is the vision of your ideal health and happiness? What are you able to do? Who is there with you? What inspires you about this vision of your best health and well-being? What does achieving your vision make possible in your life? When you think about this vision of you, what stands out as being important? Take time and enjoy creating this vision. Just like discovering your passion this is not a quick solution. Creating your vision is a process. It will continue to evolve. Enjoy the exploration of what you want in your future. Have fun with the markers and the eraser. Don’t get locked into a picture that doesn’t suit you. As you create your vision, do you notice your passions sneaking into the picture? Passions allow the development of powerful visions. Knowing activities and ideas that fuel your strongest emotions will create hopes and dreams that motivate you for success. Explore blending your passions into your vision. The more vivid the vision, the “stickier” it is. The stickier, the more you will be motivated and committed to success. CAUTION: Passions are powerful. To temper your passions from running all over your vision, consider your values. Sorry to throw in one more consideration. While passions add the fire to your vision, values keep you grounded. Consider a few value questions. When you think about your whiteboard vision, what stands out as being important? When you look ahead to possible changes in your life, what important aspects must be present? What are you not willing to let go of? In what ways is it important for you to remain productive in life? What part of your life is most meaningful? I do not know an official count for all the reasons we get derailed from having what we want in life. I believe this may be the most common. If you don’t know where you want to go then it will take a mighty long walk to get there. Clients often start a coaching session knowing they are not happy but unsure of what happiness looks like. Take time to discover or rediscover your passions. Create your vision of future happy, healthy you. Consider your values and don’t lose sight of what is truly important in your life. Explore your hopes and dreams. Maybe you are already there or maybe it’s time to begin your journey. Are you ready to make change? 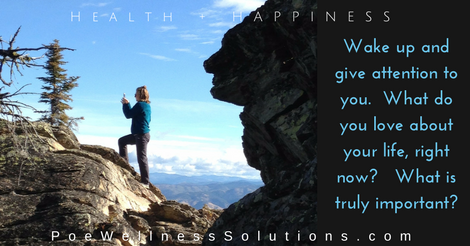 Have you already found your health and happiness? How has your passion, vision and values impacted your success? We always enjoy hearing from you! If it would make sense to have assistance in discovering your passions, creating your vision or identifying your values, contact us. Enjoy a free, one-time call and begin developing a partnership today! Interested in purchasing Richard Chang’s ~ The Passion Plan? Get the details here. 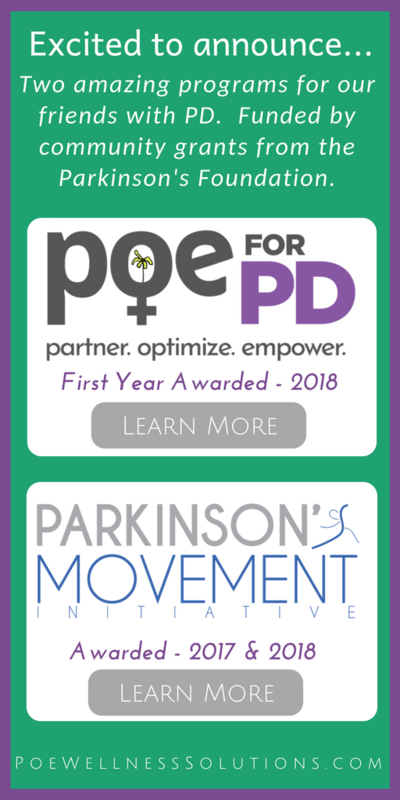 Meg Poe is The Coaching Yogi, founder and owner of Poe Wellness Solutions, Integrative Health Coach and teacher of movement and mindfulness. She graduated from UNC-Chapel Hill with a Masters in Exercise Physiology, is a Duke University certified Integrative Health Coach and is completing the 300 hour Yoga Teacher Training at Asheville Yoga Center. 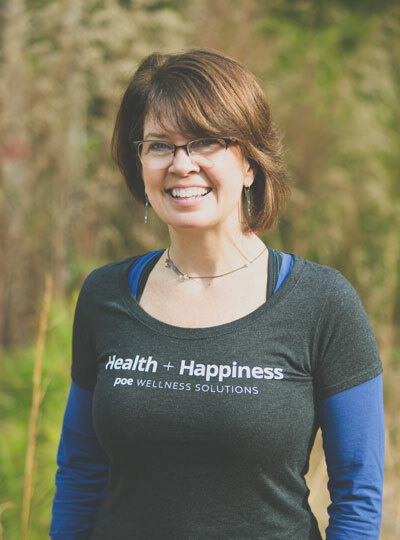 As a National Board Certified Health and Wellness Coach, Meg partners with individuals and groups as they wake up to their mind, body, life, health and happiness. Partnering with people to live their optimal health and happiness is my passion. Let’s do this! That was a very powerful message. Will be rereading it a lot. I agree. Our passions and vision are very powerful and constantly evolving. I wonder how much time and attention any of us are truly giving them. Thank you for reading/rereading and commenting. Thanks for the inspiring article. Yes! A perfect miracle question. Thanks for reading and sharing your thoughts.